The Justice League movie screened yesterday and fans were able to watch their favourite comic book heroes in action. And with Gal Gadot as Wonder Woman, the queue must have been long. Purchase the Justice League Cars at the price of RM15. 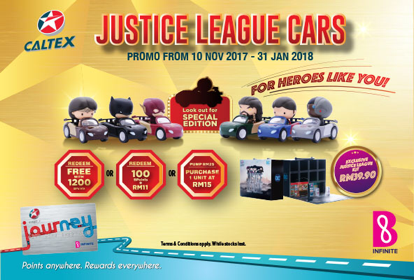 Partial redemption of the Justice League Cars using 100 BPoints from the JOURNEY Card or B Infinite card plus RM11. Full redemption of the Justice League Cars using 1200 BPoints from the JOURNEY Card or B Infinite card. There are more than 420 stations throughout Peninsular Malaysia, so getting the collectible toys would not be an issue. But of course, it’s while stocks last. On top of that, JOURNEY Card and B Infinite card members are entitled to purchase the Justice League Collector’s Kit at the price of RM39.90. The promotion is valid 10th November 2017 till 31st January 2018. Don’t wait till they run out!